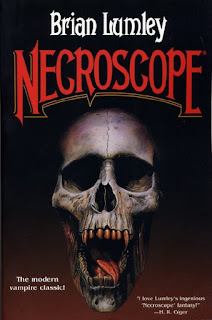 S E Lindberg: Necroscope - Review by S.E. Necroscope - Review by S.E. 1) Heroes of Dreams & Khash series: I discovered Lumley’s writing via his Weird Sword & Sorcery. Vintage dark fantasy spawned in the early 1900’s from the work of pen-pals R.E. Howard and H.P. Lovecraft; though it seems rare to find quality Conan-Mythos mash-ups. Lumely has done so a few times. First, his Hero of Dreams series is an overt mashup of Lovecraft’s Dreamcycle and Leiber’s Fafred and Gray Mouser series. Lumley’s Tarra Khash series (a.k.a. Tales of Primal Land) was written in a similar vein (i.e. fun Sword & Sorcery adventure in a Weird-Fiction, Cthulhu-esque world). 2) Blood Omen Legacy of Kain: A huge fan of the Horror S&S Game Series “Blood Omen: Legacy of Kain”, I was delighted to learn that Lumely’s writing influenced Denis Dyack’s vision of Nosgoth. Denis Dyack, creator of Silicon Knights, made the original Blood Omen: Legacy of Kain game (various incarnations from 1996 thru 2009). As a Kain fan I did not know the influence from Lumely until I saw an interview on Youtube (The Quantum Tunnel 2016 called Blood Omen Legacy Of Kain Deep Dive 1) in which Dyack reveals that the classic horror/action-rpg game was influenced by Lumey’s Necroscope series. Given the Visceral, Vampire, Lovecraftian, and Time Travel elements, this makes sense; however, the book has a contemporary setting versus the medieval one in the game. As a fan of Khash, Heroes of Dreams, and Legacy of Kain… I just had to check out Necroscope. So what is it really? Necroscope is “ESPionage” fiction (a word coined in this book), blending paranormal horror with spy adventure. It kicks off a series of 18 books (published 1986 to 2013). This first entry is entertaining and sets an expansive foundation for a wild ride. People with supernatural powers (predicting the future, speaking to the dead, etc.) are being enlisted into government agencies. The book is ostensibly about the battle between the United Kingdom vs. the Russian governments special forces, but the conflict is really about Harry Keogh (speaker to the dead) vs. Boris Dragosani (who approximates a vampire). Each is associated with a government, but each is motivated by personal goals which take center stage. The reader learns about supernatural powers as these two do. After they master their respective powers, they go to battle in a most bizarre way chock-full of undead things and over the top time travel. Expect lots of changing perspective and lots of story threads that will gel about half way through. Artwork is unexpectedly sprinkled throughout the book (even the Kindle version). The geometry puzzles and Moebius Strips shown relate the story and make for fun, relevant, diversions. This is very digestible horror for non-horror fans. A very fast read, recommended to just about everyone who likes dark adventure.